Sign up to gain free access to a highly focused collection of key learning suppliers offering leading learning technologies, tools, products, and services—all conveniently under one roof! 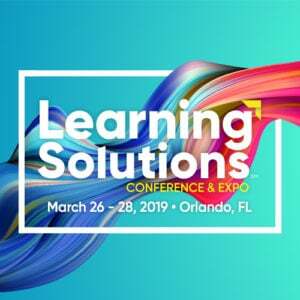 Visit both days of the Learning Solutions Expo on March 26 and 27, 2019, and meet with dozens of leading suppliers of learning tools, technologies, and solutions at the Expo Hall. Explore real-world learning projects created by your peers at DemoFest. Connect with conference speakers, colleagues, and leading eLearning suppliers at the Expo Reception. Check out the full Expo+ Pass schedule. Register for your free Expo+ Pass.